Back in July, I started running. That would not be a particularly notable statement for many people, but most people haven't detested running all their lives and avoided it for thirty years. Instead, I've used stairclimbers and ellipticals for many years, but I've grown to hate my elliptical even more than I hated running. (It's a Livestrong 10.0E which always required constant tweaking to keep it from clanking intolerably, started showing rust after only six months, and is now approaching its second flywheel replacement. Never ever buy anything made by Johnson, regardless of which brand it says it is.) I didn't feel like using that, I didn't feel like driving to work or a club multiple times a week, but I needed to do something. More as an experiment than anything else, I forced myself to try running again. 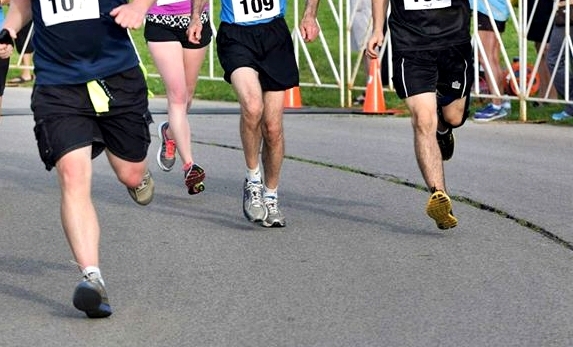 It turns out that the reason I hated running is that I was doing it wrong. Yeah, I know that sounds crazy. How can a supposedly-smart person fail at something so basic as running? Well, the problem is that a "traditional" heavy-heel-strike running style just doesn't suit me. Maybe it works for a lot of other people - I still see most runners on the road using that style - but it always makes me feel like I'm knocking the breath out of myself with every step. When I first started out on that July day, running was just as unpleasant as I had remembered. However, I had read a lot about barefoot running and landing one's weight more on the front or middle of the foot, so I decided to give that a try. That was just so much better - not exactly fun, I guess, but not particularly unpleasant either. So I stuck with it. When I first started, I could run 2.5 miles in about 28 minutes - probably about ten minutes per mile while actually running, plus plenty of walking breaks. Three months later, I'm at about 21:30 (8:36 per mile). Better still, I can maintain that exact same pace even at five miles. My time at the midpoint of that route - the top of a 5% grade - is exactly the same as my time for the shorter route. No, I don't understand that either*. My goal is to do at least one unofficial 10K before Thanksgiving. My stretch goal is to do it in under 50 minutes. It's good to have goals. So, am I "one of those runners"? According to some definitions, which separate running from jogging at 10:00 per mile, yes. I certainly don't feel like I'm jogging. If I had to stop suddenly, my momentum - except on steeper climbs - would carry me forward more than one step. That seems like an interesting cutoff. I've run six days out of seven, and twelve out of fifteen. I've run in the rain, and I plan to run in the snow at least some of the time this winter (probably on the Minuteman bike trail because road running in winter seems pretty scary). I've also lost five pounds and my resting heart rate has gone from 60 to 54. I think about runnning, talk about running, and now I blog about it too. So yeah, I guess I'm a runner. Being a competitive guy, I also wonder whether I'm a good runner. I certainly don't feel like I am yet. Five miles in 43:00 (my best result so far) doesn't seem all that impressive, even if there is an annoyingly steep climb in the middle and slight uphill for the entire last mile. I probably do fall below the "jogging threshold" sometimes, and my training focus right now is on maintaining good pace along the entire course. On the other hand, I've checked last year's results from races in Lexington and Andover. According to those, I'd consistently place about a third of the way down. Of the people I see on the road, most of whom do not enter races, I'd say only half that many seem to be going faster than I am (I don't seem to run the same routes/times as others enough to make a more direct comparison). That doesn't make me feel like any kind of a champion, but - more importantly - it keeps me from feeling like so much of a slouch that I get discouraged. I feel competent, and I know I can get better, so that keeps me going. The other thing that keeps me going is the people who have encouraged me and given me advice. Hank, Mike, Patrick, Allison, Shari, Nick, David - you all rock. You guys at Greater Boston Running Company, who helped me find the right shoes when I had ankle problems, rock too. I feel fitter now than I have in a long time, perhaps ever, and I couldn't have done it alone. Who would have thought that something so "obviously" solitary as running could be so social? * UPDATE: ...and it's actually not true any more. I actually wrote this a couple of days ago. Today, with the extra incentive of getting in before a break in the rain ended, I managed 21:06. I guess the difference in my pace from week to week outweighs the difference from course to course.